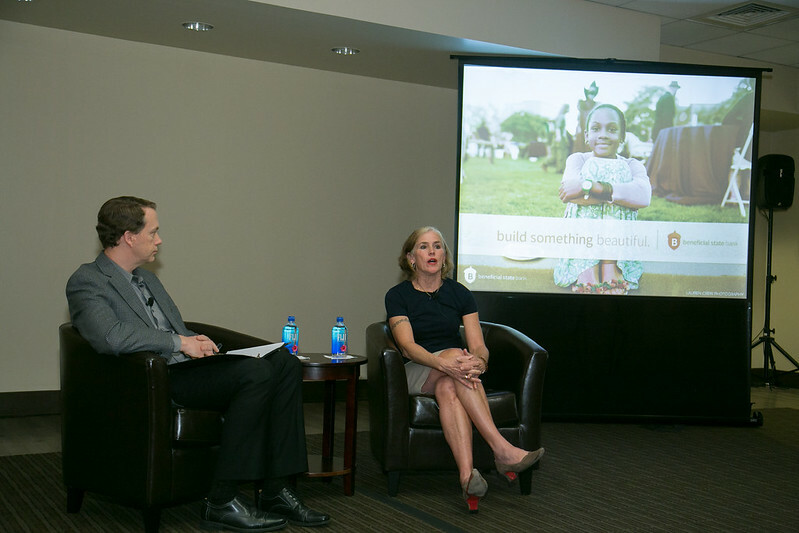 Banking is a powerful, publicly endowed system that should serve a public purpose, but hasn’t done so in some time, asserted Beneficial State Bank CEO Kat Taylor during a Feb. 8 speaker series event presented by the USC Sol Price Center for Social Innovation. Taylor, along with her husband, Tom Steyer, founded Beneficial State Bank in 2007. With 17 branches throughout California, Oregon and Washington, the bank is a Community Development Financial Institution and Certified B Corporation with the mission to bring beneficial banking to low-income communities in an economically and environmentally sustainable manner. Calling banks the original and most powerful form of crowdfunding, Taylor contended that 95 percent of the assets under control of the biggest banks do not support positive societal outcomes. She noted that, in the past five years, banks have provided $250 billion to finance the coal industry, supporting fossil fuel’s grip on the economy, while also keeping in business the private prison system that leads to mass incarceration. Beneficial State Bank, which controls nearly $1 billion in assets and employs 260 people, works to serve customers, employees, communities, the planet and shareholders in equal measure. While maintaining a focus on being a profitable enterprise, Taylor said she doesn’t want the bank to have more than a 10-percent return on equity, or else they are either not paying the employees well enough or are charging customers too much. Each year, the equivalent of between 5 and 10 percent of bank profits is recycled back into the communities the bank serves through a locally based sponsorship program. Beneficial State Bank’s lending practice commits at least 75 percent of loan dollars to support nonprofits and businesses that align with the bank’s social and environmental mission, and the remainder cannot work against that mission. With $1 billion being a drop in the bucket of a $12 trillion system, Taylor stated that Beneficial State Bank is in the process of creating a playbook for how other banks can prosper economically while catalyzing positive change.